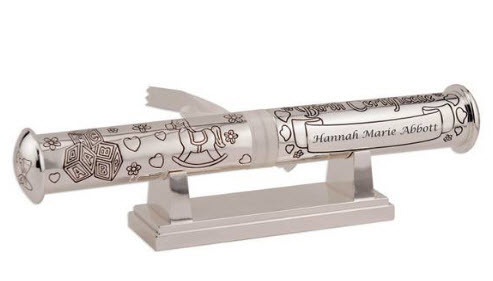 Personalized Gifts Give a Lifetime of Memories to a Mommy! Our team at Memorable Gifts was delighted to receive this warm email from a happy customer – Robin Goody, a wonderful mommy who was determined to make her son’s birthday memorable, despite her demanding work schedule. Our son’s first birthday has been the highlight of this summer for me and my husband. With our demanding jobs we had anticipated a low-key celebration, but it turned out to be one of the most memorable days for our friends, family, and our little bundle of joy – Luke! Peter and I had marked our calendars to plan our son’s first birthday. Although we weren’t planning on anything fancy, we really wanted to do something outside the box and special. It was heartbreaking to find ourselves neck-deep in meeting our deadlines the week before Luke’s birthday, when all we wanted to do was go out and shop for something unique. With only a few days left for the D day, a close friend mentioned Memorable Gifts offered personalized birthday gifts and personalized baby gifts. I didn’t waste a single moment to jump on my computer and explore your exceptional world of goodies, to realize that Peter and I were being so conventional about imagining Luke’s birthday. Memorable Gifts opened our doors to creativity! The idea of engraved gifts appealed to us a lot. One look at the treasure of personalized accessories on your site and we knew that we could come up with a wonderful theme for Luke’s birthday party in our home. That day at work, Peter and I shortlisted our favorites from the wonderful ensemble of personalized treasures available on site. Our favorite pieces out of this precious assortment were: Silver Birth Certificate Holder with Personalized Stand, Happy Birthday Personalized Teddy Bear, and the Baby Booty Keepsake Money bank. I didn’t sleep a wink that night, wondering how it will all come together. Not having much experience with online ordering for gifts and being a little old-fashioned about choosing presents, I was praying that those items look just as adorable in real life and the ordering process will be smooth. Peter and I had mentally visualized how we should be decorating the space in our house where we were hosting Luke’s birthday. I woke up early next morning and experienced a rush of excitement as I went about ordered the gifts on MemorableGifts.com that we had shortlisted the previous night. To my relief the entire process of personalizing, putting a request for engraving Luke’s initials on the gift items, and payment was a breeze! Your customer service was warm, prompt, and beyond our expectations. I couldn’t believe that something for which we had anticipated over a week’s planning was over within an hour. It felt wonderful to decorate the walls, counter tops, and corners of Luke’s birthday space with personalized frames, keepsake boxes, art panels, and all kinds of wonderfully unique stuff that is rarely found in regular gift stores. It was truly a one-of-a-kind birthday with a heartwarming atmosphere filled with love. Our family members and friends couldn’t stop admiring the personalized theme. I love the What friends are made of personalized throw and so many more things that you have.